He smiled, and a hundred girls swooned. The movie theater bubbled. The atmosphere thickened with a buzz, a twitterpation, a riveting sense of wonder. 10 Things I Hate About You. And it began. And then it ended far too soon. I don't really know how to go about this, because, well, it's one of my first entries, and I don't know what to write. 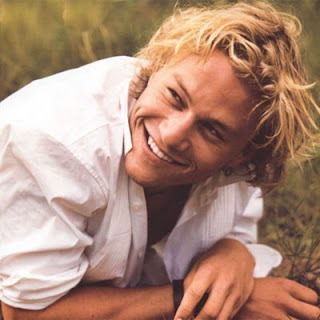 I'm so desperate and hurt by Heath Ledger's death that I don't even know what to think. Mostly, I just tell myself that he's in this big, golden, grand place where there are fields and trees, a place where all of the timeless characters of our past, the James Deans and the Marilyn Monroes, the ones who went away too soon, gather in robes to look down on our world. And there is wine and there are harps. I'm getting carried away, but I can't help it. It's Heath Ledger: a skilled, severe, and dedicated actor. He is, perhaps, the most revered actor of our generation, the man who brought us Ennis Del Mar and Casanova. He was pure, and he has a baby daughter named Matilda, and it's not fair, because he's gone. So, as I sit here right now, harboring this strange delusion, all I can do is watch and remember. I can just drink my glass of cheap red wine, watch 10 Things I Hate About You, and toast to a young man we never knew well enough. And I can wait. For The Dark Knight. For the final, agonizing bow. For that moment at the end of the credits when I'll just be sitting in the theater, staring into an empty, frozen screen, hoping that Heath's absence is nothing but a nightmare, and that one day, we'll all wake up.